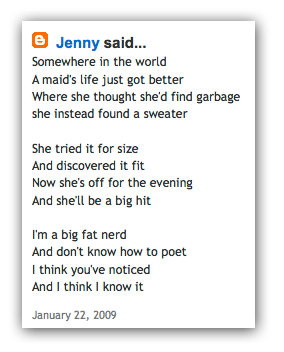 "Jenny" of the inaccessible profile left the following comment . . . It's a no-miss addition to my little poem. Simply adorable, Jenny. And if I could access that profile of yours, I'd send you a friendly email telling you that I seriously doubt that a) you're big, b) you're fat, and c) you're a nerd. You're very generous in your reversal of my self-deprecating comments. Thanks!